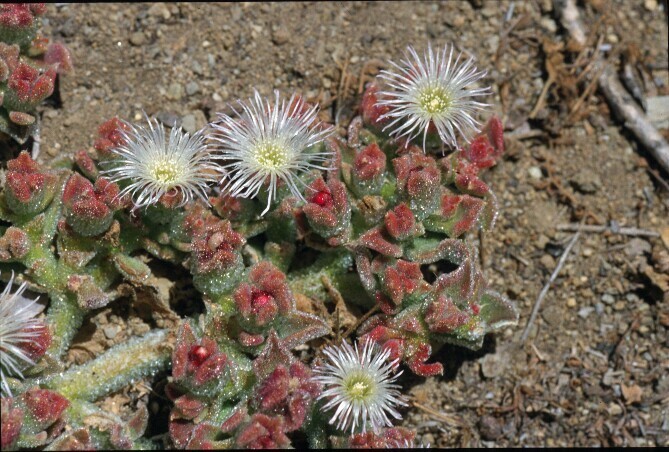 Crystalline iceplant is a low-growing succulent that spreads over the ground with flat, fleshy leaves. 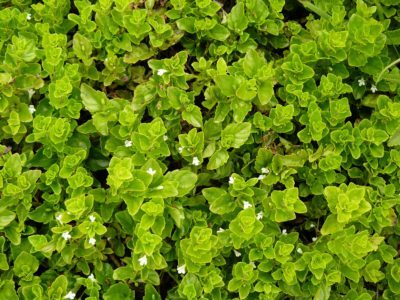 The leaves are covered with distinctive tiny, clear, blister-like out growths. 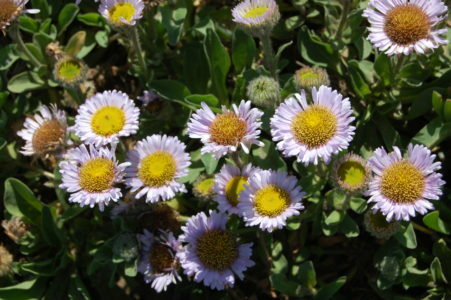 The flowers are small with many narrow petals. The stems can range from green to red. 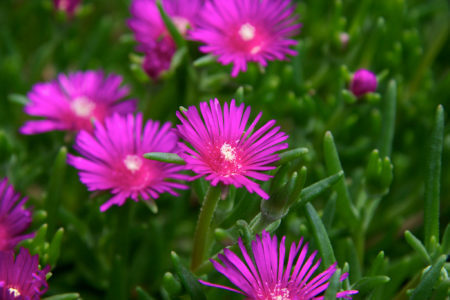 Like Carpobrotus edulis, crystalline iceplant is native to South Africa. It is thought to have been introduced to California in sand used as ships' ballast as early as the 1500s. Transportation then began using it for roadside landscaping and erosion control. 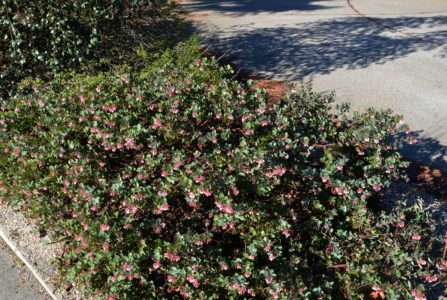 The practice was discontinued in 1969 when it was discovered that the plant was killed by hard freezes and not effective for erosion control on steeper slopes. 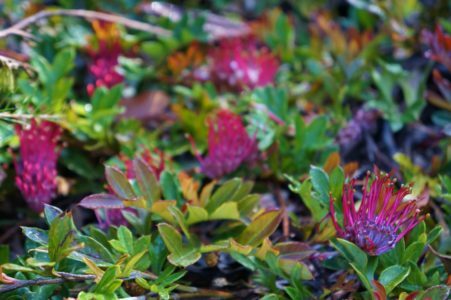 How does crystalline iceplant spread? 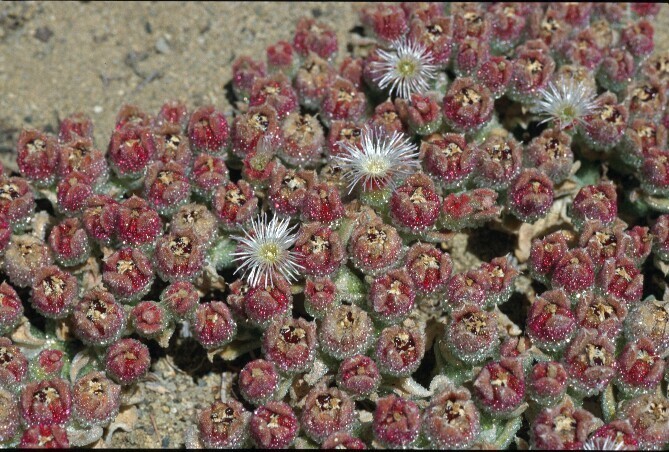 Crystalline iceplant usually flowers from March to June. 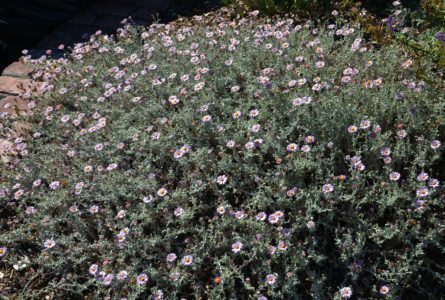 Germination is staggered so individual plants can be flowering most of the year. 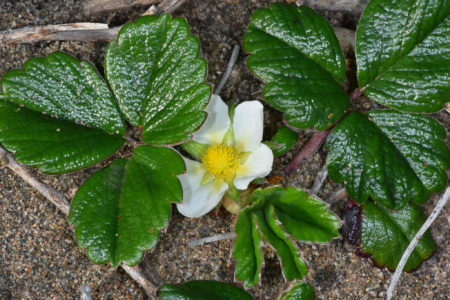 After fruiting, the plant dries from the base upwards and the fruits dry last. Rabbits and mice aid in the dispersal of seeds. 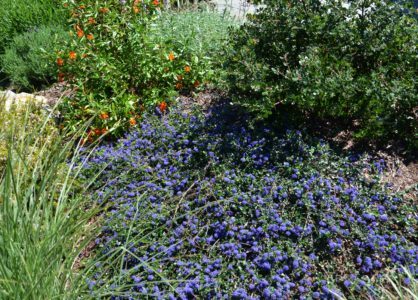 The seeds germinate with the first rains in fall and seedlings continue growing rapidly until spring. 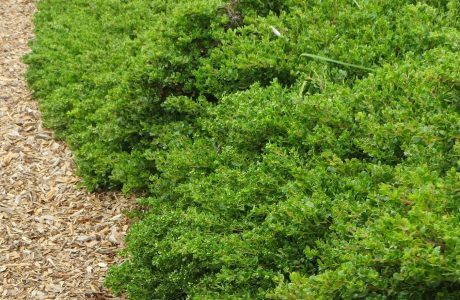 Vegetative growth slows and then stops as the hot, dry summer season progresses. 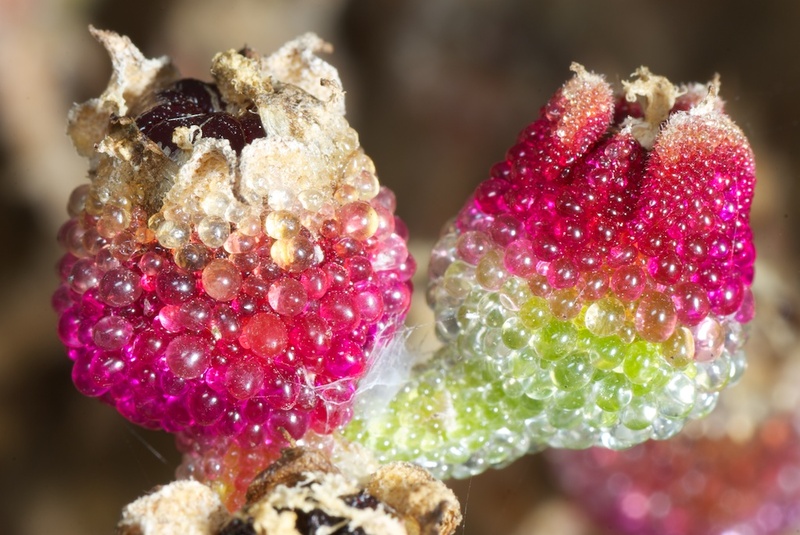 Where is crystalline iceplant found? 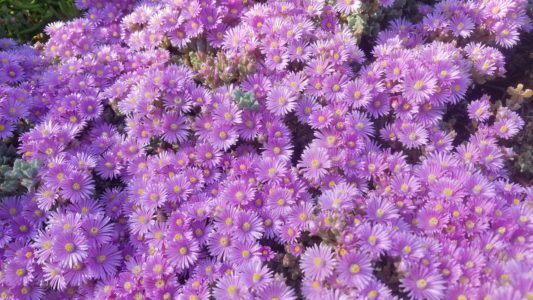 Crystalline iceplant occurs along the immediate coast from the San Francisco Bay area into Baja California, Mexico, with more occurrences along the South Coast. 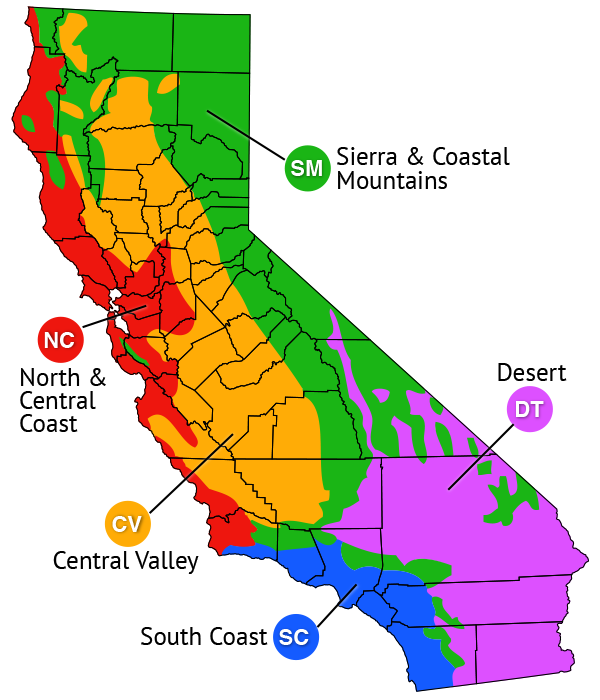 CalWeedMapper shows its current distribution. 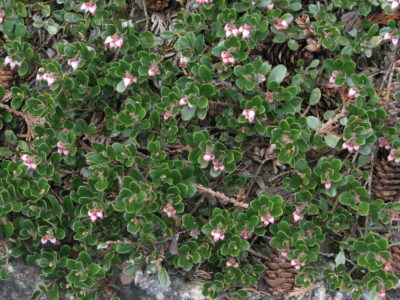 It is found primarily in saline soils, coastal sage scrub, coastal bluffs and cliffs, and other disturbed ground. It tolerates saline soils but not frost. 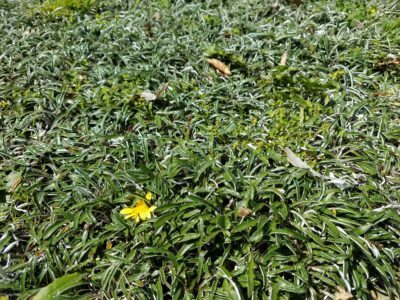 What problems does crystalline iceplant cause? 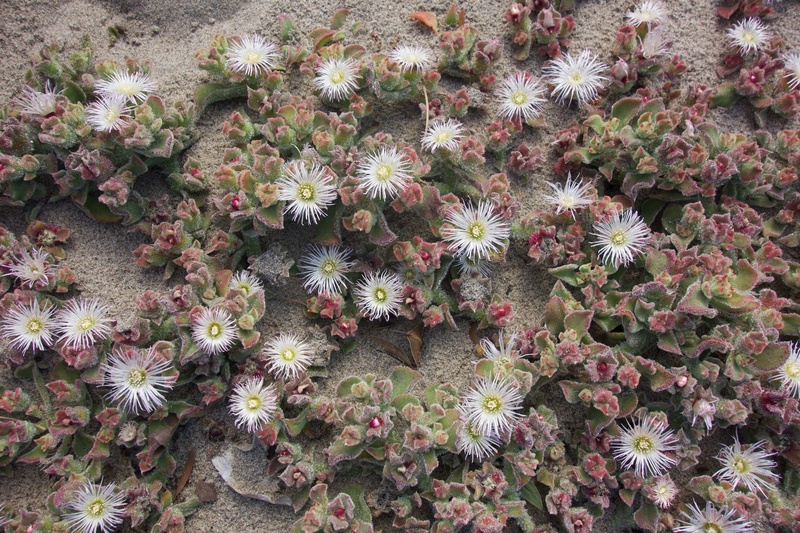 Crystalline iceplant can invade coastal bluff areas and compete with native species. 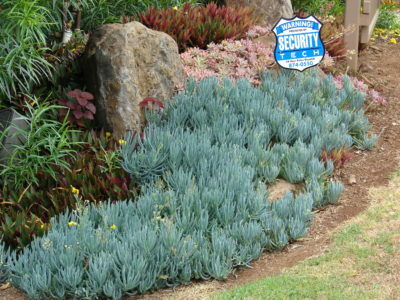 It can outcompete most other species for water because it has an exceptional ability to absorb moisture from the soil. 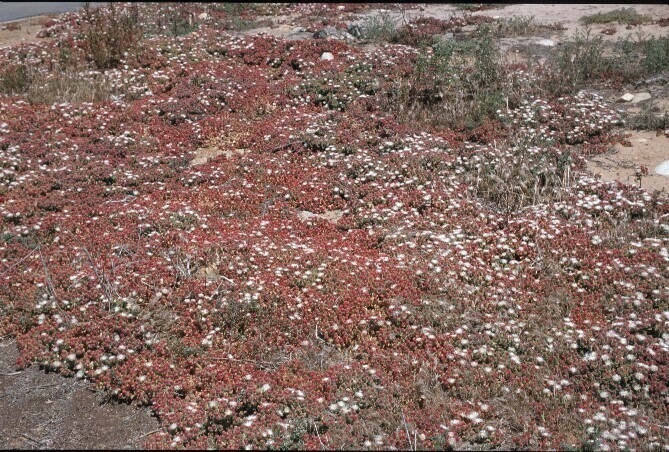 A high level of nitrate builds up in the soil beneath the plant, which can be detrimental to the survival of grassland seedlings growing there. 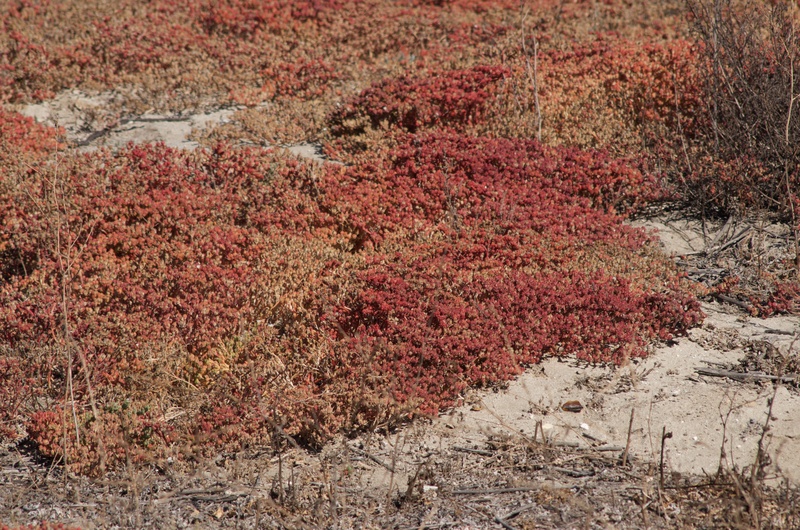 Crystalline iceplant also accumulates and releases salts, which can prevent or slow the reestablishment of native species.